Scooby-Doo Mystery is a point-and-click adventure game released for the Sega Mega Drive based on the cartoon series, Scooby-Doo. It was only released in the Americas. On the Mega Drive, Scooby-Doo Mystery takes the form of a point-and-click adventure game, with strong similarites to produce from Sierra On-Line from around this period. The player takes control of Scooby and Shaggy solving one of two mysteries; "Blake's Hotel" and "Ha Ha Carnival". The game attempts to replicate the earlier series of the show, in that Scooby and Shaggy are assisted by Fred, Daphne and Velma. 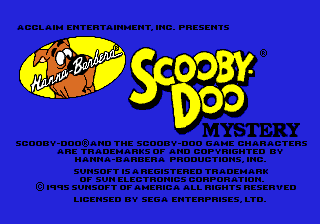 An entirely different Scooby-Doo Mystery game was released on the Super Nintendo Entertainment System around the same period, which takes the form of a side-scrolling platformer rather than a slower-paced adventure title. Very little is shared between the two, save for the core concept of the Scooby-Doo cast solving mysteries and some similar music tracks. Despite resembling PC adventure titles, no PC version of Scooby-Doo Mystery was ever released, nor does the game support the Sega Mouse. Main article: Scooby-Doo Mystery/Magazine articles.